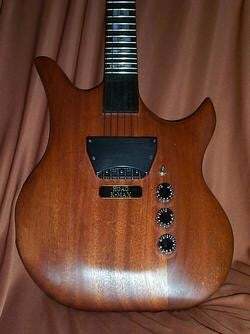 I'm sure this has been out for a while, but this is the first time I've ever seen an optical guitar. Apparently, this thing detects string vibration optically rather than magnetically, which means you can have a big set of sloppy rubber bands on there and the pickups will still be able to register it. Very strange. This pickup is responsive to string movement below and well above human hearing. Lower the string pitch to "shake the walls" or play the upper register to make violin sounds, is up to the musician. Because the pickup is optical it can see any type of string, steel, nylon, bronze, gut etc. or intermix. Can anyone shed some light on this? HAR!